Is your Microsoft Xbox 360 acting up and you're not sure why? Whether it suffers from the RROD (Red Ring of Death), disc read errors, or any other problems, let the experts at PC Doctor bring your system back to life with our express Xbox 360 repair service. We work quickly and diligently, so you're sure to be back playing with your Xbox 360 before you know it. 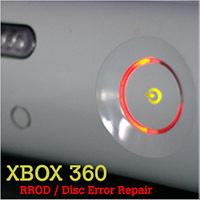 Xbox 360 Repair Service now includes Fan Mod to prevent future RROD and overheating problems.